When it comes time for me to style my hair, I'm usually pretty picky - Unlike my make-up which usually takes me less than 10 minutes, my hair is a different case. First of all it doesn't help that my hair is fairly thin, so to find products that actually make a difference is quite difficult. After so many disappointing purchases, I've compiled the ones that actually do what they say - So I'll be sticking with them for a while. KMS CALIFORNIA Dry Shampoo, $12.12: This stuff is incredible, smells amazing, and doesn't leave any wide powdery residue - What's not to love? I use this even when my hair isn't greasy to add a bit of volume. If I run out of this stuff, I quickly resort to the good old fashion baby powder to do the trick:). REDKEN Hairspray, $14.48: First and foremost, anything Redken is incredible. I have yet to try a Redken product that doesn't do what it claims. I love that it holds your style in place, without any build up - Leaving your hair touchable and free falling. Make a mistake? No problem. You can easily brush it out, without it feeling crunchy. The smell is also quite pleasant! MOROCCANOIL Hair Serum, $43.00: Bit on the pricey side, but this stuff will last you forever! I've had mine for over two years now - I like to use it after every shower when my hair is damp or after I've styled my hair to tame flyaways and add shine. One pump is really all you need, depending on your hair length of course. I don't recommend using anymore than required as your hair will start to feel greasy and it will lose it's purpose. AG Flat Iron Spray, $24.00: I've actually never really been a fan of AG products, but a friend recommended this product, so I thought why not give it a try. Many of the ones I've tried in the past only did more damage than good - This actually made my hair healthier and shinier! I also love how it doesn't leave my locks feeling wet, so I can immediately use my heat styling tools. Whether I'm curling, blow drying, or straightening, I use this on each individual section to ensure that I get every piece. But be careful to only use a generous amount on each section to avoid leaving your hair feeling greasy. 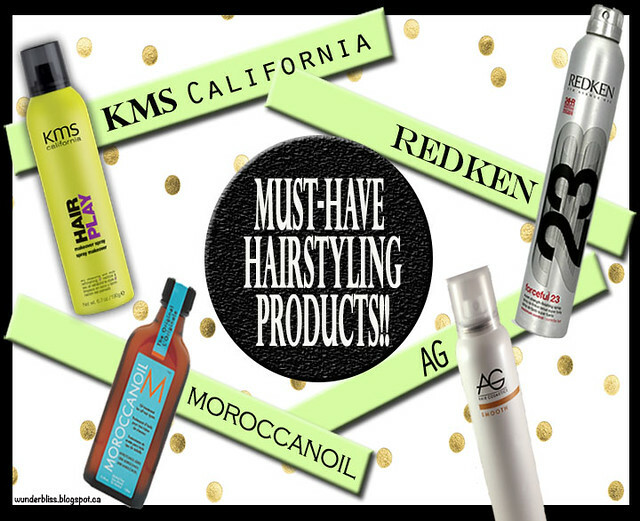 Do you have any styling products that you absolutely adore? Please comment!